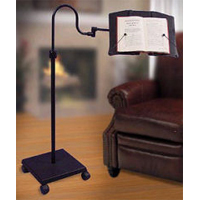 The LEVO Book Holder Floor Standing Model is an adjustable book stand that allows users to read without having to use their hands while sitting or laying in the most comfortable ergonomic position. The LEVO Book Holder offers six different movement options and can support books weighing up to 4 pounds. The LEVO can help to alleviate the stress of arched necks, fatigued hands, and pain in the back and shoulders from sitting in an awkward posture while reading. The patented design allows the LEVO Book Holder to extend from either the right or left side of furniture. It is mobile, durable, versatile, quick and simple to adjust, and no tools are required. The LEVO Book Holder works well for users reading in bed, reading while working out, reading while recovering, or reading while performing household tasks. If you are primarily using this in an office setting over a desktop, consider the more affordable Desktop Levo Bookholder as an alternative. Reduces Strain and Fatigue - The design of the LEVO allows the user to sit comfortably and access reading material in the most ergonomic position. This eliminates hunching and will reduce strain in the back, neck, shoulders, and arms. Eliminates the need to Grip - The LEVO is able to hold most books firmly in place. 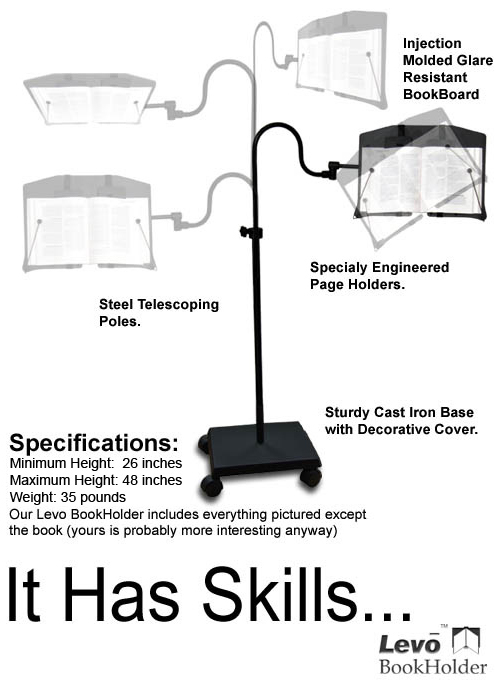 This eliminates the need for the user to grip the book for long periods of time. Increases Overall Comfort - The versatile movements of the LEVO allow users to avoid any awkward positions. It also makes it possible for the user to choose the most comfortable set up. Wide Range of Movement Capabilities: The LEVO Book Holder Floor Standing Models offers 6 movements to place your book in the most comfortable, ergonomic reading position This reduces awkward positions, tired arms, and neck pain while reading. Can Handle Heavy Materials: The LEVO is able to hold books weighing up to 3.5 - 4 pounds. The LEVO is ideal to be used with hard covers, paperbacks, magazines, and some light textbooks. Easily Moved from Room to Room: Four wheels at the base allows the LEVO to be moved with ease. Stable Design: The heavy duty 20 lb cast-iron base allows for greater stability. Minimal Footprint: The cantilever design does not require any clearance under furniture. Page Holders Give Another 'Set' of Hands: Built in page holders allow the user to turn pages easily. Safe Secure Platform Design: Books strap firmly to the easel. Easy to Adjust Height: The height of the platform is easily adjusted between 26" and 48" which ensures that the book is at eye level. 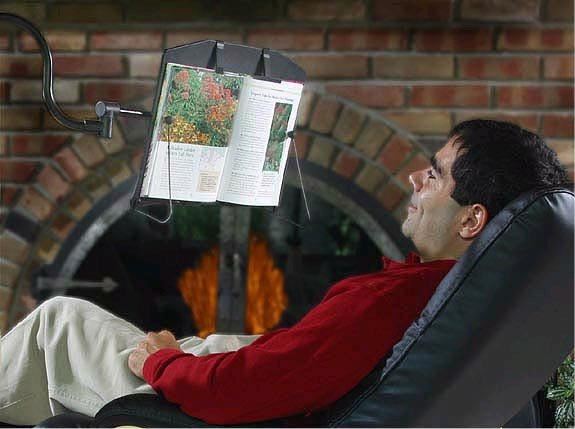 Upside Down Capability: The LEVO is able to hold books in an inverted position which allows the user to read lying in bed. 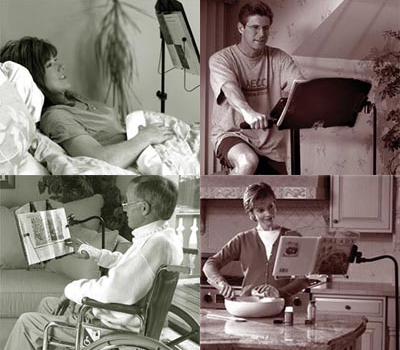 Optional Lighting Accessory: Optional LED Light clamps onto the easel to provide optimal lighting conditions. Treadmill Accessory: The optional Tread Mill Extension enables the user to read while running on a tread mill by allowing the easel to reach further from the base. Tablet Conversion Accessory: The eBook/Tablet Platform Kit is an optional easel which can take the place of the book holder to allow the user to read from their tablet. Construction material: Steel, nylon (super strong polymer), ABS (book board) and sturdy cast iron base with decorative cover.